The High-Flow Whole House Carbon Filter provides economical, high flow solutions for taste & odor removal. 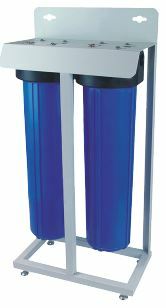 Activated carbon filtration can be used as a standalone filter to reduce or eliminate bad tastes and odors, chlorine, and many organic contaminants in municipal (pre-treated or chlorinated) water supplies to produce significantly improved drinking water. It is also very commonly used as a pretreatment as part of a reverse osmosis system to reduce many organic contaminants, chlorine, and other items.